Almost any movie buff can tell you that January and February are far from the most exciting movie months of the year. Outside of a few Oscar nominees finally receiving the wide release treatment, audiences are stuck with—and astonishingly flock to—clichéd comedies, cable-channel action movies, vapid romantic comedies, and stiff horror movies that should have remained in their coffins. It’s extremely difficult to find a diamond in the rough, but every so often, one shimmering winner shines brightly through the piles of garbage. This year’s diamond in the rough is The Lego Movie, a rainbow explosion of sugary visuals and Adult Swim humor tailored for those far too young to know what Adult Swim is. Refreshingly weird, fast paced, and quick witted, The Lego Movie is an animated jewel that almost demands to be seen twice just so audience members young and old can appreciate the clever script from directors Phil Lord and Christopher Miller. It’s also a hallucinogenic tribute to soaring superheroes, pop culture icons, and cinematic classics that audiences have all come to know and adore over the years. Did I mention that it boasts an A-list cast enthusiastically lending their voices to these little plastic wonders, and that it also sends a wonderful message to children about the power of imagination? The Lego Movie introduces us to everyman Emmet (voiced by Chris Pratt), a happy-go-lucky construction worker who always follows his instruction manual for conforming to the world around him. Despite Emmet’s best attempts to fit in with the rest of the citizens of his Lego world, the bouncy little guy always seems like the odd man out. One evening, while leaving work, Emmet spots a mysterious girl called Wyldstyle (voiced by Elizabeth Banks) snooping around the construction site. As Emmet goes to approach Wyldstyle, he slips down a hole in the ground, and comes face to face with a glowing red brick called the Piece of Resistance. Entranced by it’s beauty, Emmet attempts to touch the Piece of Resistance, but when he does, he passes out and wakes up in the clutches of Bad Cop (voiced by Liam Neeson), who is the muscle for Lord Business (voiced by Will Farrell), the sinister president of the Lego world. While being interrogated by Bad Cop, Emmet learns that the Piece of Resistance has attached itself to his back, and that Lord Business possesses a weapon called the Kragle, which is capable of freezing the entire Lego universe. Emmet is soon rescued by Wyldstyle, who takes him to meet the Master Builders—a group of heroes capable of building anything they can dream of. Among the Master Builders are a wizard called Vitruvius (voiced by Morgan Freeman), Batman (voiced by Will Arnett), the pirate Iron Beard (voiced by Nick Offerman), the overly positive Princess Uni-Kitty (voiced by Alison Brie), and ‘80s spaceman Benny (voiced by Charlie Day). It is with the Master Builders that Emmett learns that he is the “Special,” the one who can save every man, woman, and creature from Lord Business’ evil plot. The Lego Movie’s hyperactive style and rapid-fire jokes will mostly certainly turn off viewers who aren’t open to this sort of thing. But for those willing to open their imagination to what Lord and Miller have thrown up on the screen, the rewards will stretch far beyond the film’s runtime. It’s almost a given that children will be powerless against its 200-mile-per-hour pacing and the barrage of characters both old and new zipping across the screen, but the filmmakers don’t forget about the parents or those (possibly inebriated) audience members looking for a hearty dose of artistic vision. Adult DC Comics fans are sure to have just as much fun as the kids as Batman, Superman, Wonder Woman, and Green Lantern flash across the screen and cleverly poke fun at themselves, while Star Wars fans will certainly have a chuckle at one joke that flickers with Family Guy’s sense of humor. For those who spend their evenings in a marijuana cloud watching Adult Swim, the film’s bloodshot psychedelics and self-aware jabs will have them doubled over in their seats as trippy graphics and sly pop culture references leap out in 3D and call upon the spirit of Seth Green’s dementedly anarchic Robot Chicken. This strange brew may sound like an acquired taste, but rest assured when I tell you that there is a brilliant last act twist that helps this dizzying concoction of caffeinated inspiration go down smoothly. When it comes to discussing the The Lego Movie’s wide array of characters, there is a long line of A-list actors lending their vocal chords to these little marvels. Chris Pratt brings his man-child charms to Emmet, our everyman hero who proudly stands behind his idea for a double decker couch. Will Arnett lends his gruff voice to Batman, growling the expected “I’m Batman” line with an extra sprinkling of cheese. He’s easily the most fun character of the bunch, mostly because he’s so overly confident even when he’s botching his batarang throws. Elizabeth Banks makes Wyldstyle an instant plastic sweetheart with a rough and tough side. Little girls in the audience are sure to adore her as she flips, spins, punches, and kicks her way through an army of robotic bad guys. Charlie Day screeches his way through the role of Benny, the ‘80s space man who desperately wants to build the crew a retro rocket ship. Alison Brie’s coo and unpredictable mood swings make Princess Uni-Kitty downright hilarious, as she is in constant turmoil with her excessive positivity. Morgan Freeman offers his trademark vocal talents to Vitruvius, a wise but slightly spaced-out wizard with eyesight complications. Will Farrell brings his maniacal cackle to Lord Business, snarling playful threats to our heroes and his endless supply of henchmen. Liam Neeson rounds out the main cast as Bad Cop, the hushed muscle of Lord Business who will suddenly unleash his peppy side. 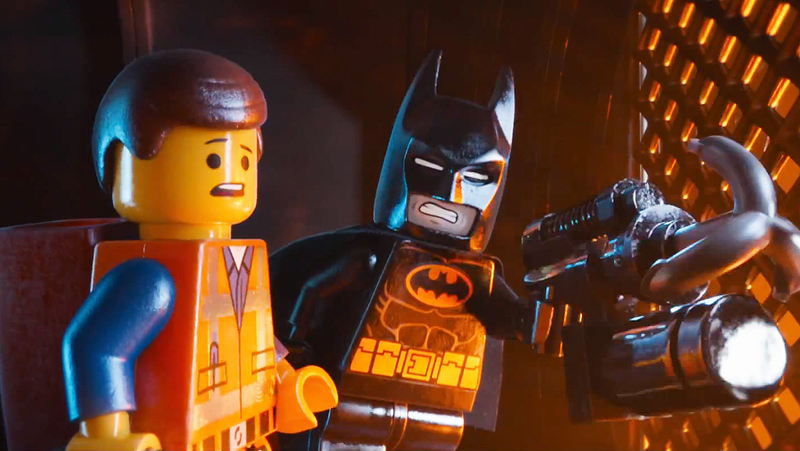 While The Lego Movie’s razor-sharp sense of humor makes it an instant winner, the real refresher here is the amazing animation that offers a nice change of pace from the computerized creations from Disney, Pixar, and DreamWorks. Though the characters and the world around them are brought to life with CGI magic, the film never truly looks like it was brought to life with a computer program. It looks like we are watching a stop motion miracle—a toy store Lego display that has suddenly leapt to crude life and started interacting with us. The filmmakers don’t forget to smartly call attention to the Lego figurine’s flexibility limits, most memorably with Emmet’s hysterical jumping jacks that he starts his day out with. The constant swirl of colors, characters, and action is all brought home with a thumping title track called “Everything is AWESOME! !” from Tegan and Sara, an indie rock duo who provide a electronic dance track that is sure to be an instant favorite in your family. 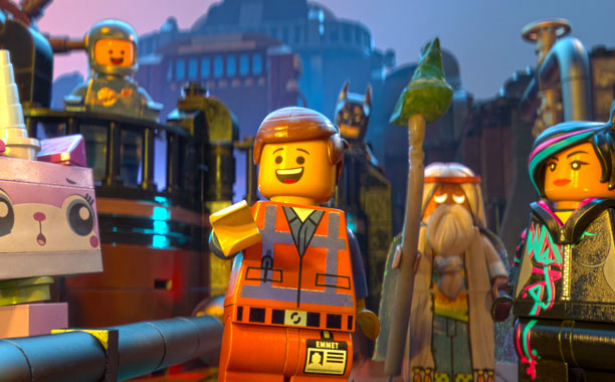 Overall, with so many animated features struggling to win the hearts of both adults and children, The Lego Movie stands tall as a shining example of how to appeal to all ages. It dares to get a little weird, a little wild, and a little satirical, but it does it with plenty of heart and intelligence, sending an enduring message about the power and importance of imagination. Posted on March 8, 2014, in REViEW and tagged 2014, alison brie, animated movies, charlie day, chris pratt, christopher miller, comedy, elizabeth banks, family films, liam neeson, morgan freeman, phil lord, will arnett, will farrell. Bookmark the permalink. Leave a comment.